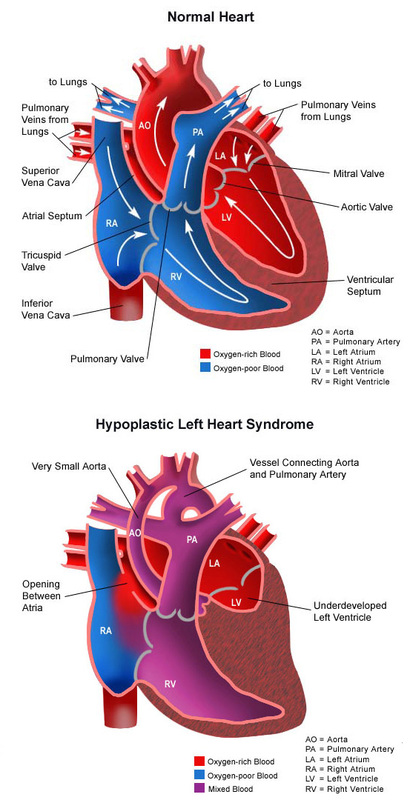 Hypoplastic left heart syndrome (HLHS) is a combination of several abnormalities of the heart and great blood vessels. It is a congenital (present at birth) syndrome, meaning that the heart defects occur due to underdevelopment of sections of the fetal heart starting during the first eight weeks of pregnancy. In the normal heart, oxygen-poor (blue) blood returns to the right atrium from the body, travels to the right ventricle, then is pumped through the pulmonary artery into the lungs where it receives oxygen. Oxygen-rich (red) blood returns to the left atrium from the lungs, passes into the left ventricle and then is pumped out to the body through the aorta. Left ventricle. The lower left-hand chamber of the heart. It receives oxygen-rich (red) blood from the left atrium and pumps it into the aorta, which takes the blood to the body. The left ventricle must be well-developed, strong, and muscular in order to pump enough blood to the body to meet its requirements. Perhaps the most critical defect in HLHS is the small, underdeveloped left ventricle. This chamber is normally very strong and muscular so it can pump blood to the body. When the chamber is small and poorly developed, it will not function effectively and can’t provide enough blood flow to meet the body’s needs. For this reason, an infant with hypoplastic left heart syndrome will not live long without surgical intervention. Some congenital heart defects may be due to a genetic defect that causes heart problems to occur more often in certain families. In hypoplastic left heart syndrome, there may be abnormalities of other organs. In many children, HLHS occurs by chance, with no clear reason for its development. Cold feet, diminished pulses in the feet. The symptoms of hypoplastic left heart syndrome may look like other medical conditions and heart problems, and will be diagnosed by the child’s health care team. In many cases, hypoplastic left heart syndrome is diagnosed while the fetus is still in the womb. After birth, the child’s parents or doctor may find the baby to be listless, breathing rapidly or cyanotic (blue). Infants with hypoplastic left heart syndrome are admitted to the NICU or CVICU. Initially, the child may be placed on oxygen, and possibly even on a ventilator, to assist with breathing. Intravenous (IV) medications may be given to help the heart and lungs function more efficiently. Staged surgery repair is usually the treatment of choice for HLHS. Stage 1: Norwood procedure. The first operation takes place shortly after birth and serves to make the right ventricle the main pumping chamber for blood flow to the body. The outflow from the right ventricle (the pulmonary artery) and the outflow from the left ventricle (the aorta) are connected side-by-side in order to allow all blood from either the right or left ventricles to reach the body. A connection (shunt) is also made to make a pathway for blood to flow into the lungs to receive oxygen. Following this operation, the infant will still have cyanosis since oxygen-poor (blue) blood from the right atrium and oxygen-rich (red) blood from the left side of the heart mix and flow through the aorta to the body. Stage 2: Glenn shunt. The second operation takes place at about 4 to 6 months of age and replaces the shunt supplying blood flow to the lungs with another connection to the pulmonary artery. In this operation, the shunt is removed, and the superior vena cava (the large vein that brings oxygen-poor blood from the head and arms back to the heart) is connected to the right pulmonary artery. Blood from the head and arms then passively flows into the pulmonary artery and lungs to receive oxygen. However, oxygen-poor (blue) blood returning to the heart from the lower body through the inferior vena cava will still mix with oxygen-rich (red) blood in the left heart and travel to the body, so the child will remain cyanotic. This operation helps create some of the connections necessary for the final operation, the Fontan procedure. Stage 3: Fontan procedure. This operation takes place at about 2 to 3 years of age and allows all the oxygen-poor (blue) blood returning to the heart to flow into the pulmonary artery and lungs, greatly improving the oxygenation of the blood. The Glenn shunt, connecting the superior vena cava to the right pulmonary artery, is left in place. A second connection is made directing blood from the inferior vena cava to the right pulmonary artery as well. This connection can be created in slightly different variations, depending on the method child’s surgeon prefers, and what is best for the child. What is the postoperative care for a child after surgery? Ventilator. A machine that helps the child breathe while he or she is under anesthesia during the operation. A small, plastic tube is guided into the windpipe and attached to the ventilator, which breathes for the child while he or she is too sleepy to breathe effectively. After a HLHS operation, children will usually benefit from remaining on the ventilator for at least a few days. Urinary catheter. A small, flexible tube that allows urine to drain out of the bladder and measures how much urine the body makes. This helps determine how well the heart is functioning. Immediately after surgery, the heart will be a little weaker than it was before, and the body may start to hold onto fluid, causing swelling and puffiness. Diuretics may be given to help the kidneys to remove excess fluid from the body. Heart monitor. A machine that constantly displays a picture of the child’s heart rhythm, and monitors heart rate, blood pressure and other values. Additional equipment not mentioned here may be required to support the child after surgery. The hospital staff will explain all of the necessary equipment. Occasionally, the chest may be left open for the first few days, and covered with a special bandage. The open chest prevents compression of the heart by the rib cage. The chest is then closed several days later after the swelling in the chest has gone down and the heart has had a chance to adjust to the new circulation. Children are kept as comfortable as possible with several different medications—some that relieve pain and some that relieve anxiety. The staff will also be asking for the family’s input on how best to soothe and comfort the child. As the baby recovers from surgery, the staff will provide instructions regarding medications, activity limitations, and follow-up appointments before the child is discharged. Learn more about the CVICU. High-calorie formula or breast milk. Special nutritional supplements may be added to formula or pumped breast milk to increase the number of calories in each ounce, thereby allowing your baby to drink less and still consume enough calories to grow. Gastronomy tube. Occasionally, a more permanent feeding tube, called a gastrostomy or G-tube, is necessary to ensure that the baby takes in enough calories to grow and gain weight. How is a child cared for at home after hypoplastic left heart syndrome surgical repair? If any special treatments are to be given at home, the nursing staff will ensure that family members are able to provide them, or a home health agency may assist. Families may receive additional instructions from the child’s health care team. What is the long-term outlook for hypoplastic left heart syndrome? Hypoplastic left heart syndrome is a very serious congenital heart defect, and infants and children who have the staged surgical procedures will require special care and treatment to support growth and nutrition. These children may have diminished physical strength as well as slowed developmental progress and may need support. Regular visits with the child’s cardiologist are crucial to monitor the child’s progress and to support his or her health. Medications may be necessary to maintain the child’s level of health. The child’s cardiologist will provide you with ongoing, regular information regarding the child’s specific prognosis and health care needs. Hypoplastic left heart syndrome is a rare congenital heart defect. 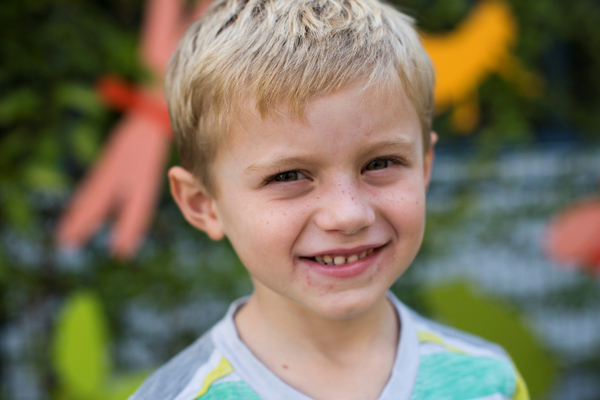 Because Cyrus’ defect was diagnosed prior to his birth, his parents were able to work with our Heart Institute specialists to come up with a treatment plan before he was born. A congenital heart defect diagnosis is bound to bring up a lot of questions. At CHOC Children’s, we are by each family’s side every step of the way. Because we also feel that knowledge is power, we enourage families to learn about all of the services they may experience while receiving treatment.